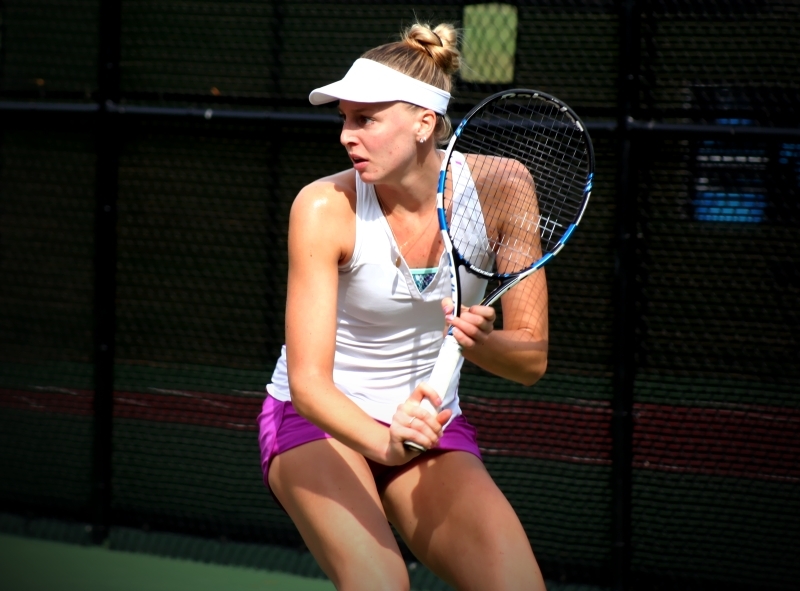 Great weather in Macon, means a full schedule of great matches in Macon and Thursday was no exception at the USTA Pro Circuit event taking place October 25 – November 1, 2015. Four of the matches pitted American vs. American and that attracted the interest of tennis fans in middle Georgia. Julia Boserup started the day on the center court by facing former North Carolina Tar Heel, Sanaz Marand. Boserup used her aggressive backcourt game to keep Maran off balance and and bay as she earned early service breaks in both sets to take a 6-2 6-2 victory. Tournament top-seed, Anna Tatishvili kept rolling along on Thursday with a convincing 6-2 6-3 win over 17-year old American, Nicole Frenkel. Tatishvili proved to be a little more consistent on the big points even though Frenkel’s hard-hitting serve kept her guessing. Frenkel only won 38% of second serve points throughout the match and that proved costly. In an all UCLA Bruin matchup, Jennifer Brady defeated Robin Anderson 6-3 4-6 6-3. In the match of the day and one that attracted interest from fans all over the grounds, American, Jacqueline Cako defeated yet another American in Michaela Gordon 4-6 7-5 7-6 (4). While this might see like your typical long women’s match, the match lasted a whopping 4 hours and 19 minutes. Some additional stats from the match: there were 261 total points played with Gordon winning 131 and Cako 128. Each player was broken seven times and there was only one ace in the entire match (Cako). Cako had to turn around two hours after her marathon victory and take the court for singles again. This time falling to Rebecca Peterson of Sweden 6-2 6-1. Second seed, Naomi Broady was defeated in the second round by Lesley Kerkhove 6-7 6-4 6-4. Most of Thursday was spent taking advantage of the perfect weather to get caught up on singles actions, but the main draw of doubles did start in the mid afternoon.